A San Diego police sergeant was out on bail Tuesday following his arrest over the weekend in connection with an alleged off-duty assault on his girlfriend in the Gaslamp District. Oscar Armenta, a 13-year veteran of the San Diego Police Department, allegedly battered the woman in the 700 block of Island Avenue shortly after 8:30 p.m. Sunday, according to SDPD officials. Authorities did not disclose the extent of the woman’s injuries. The sergeant was booked into county jail on suspicion of domestic violence, then released after posting bail of $25,000. 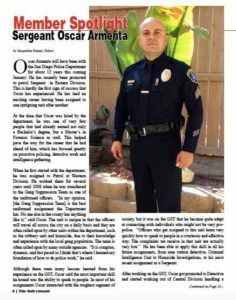 Armenta, who has been placed on paid leave due to the allegations, “is facing both criminal and administrative consequences as a result of this incident,” said public-affairs Lt. Scott Wahl. “We hold ourselves to the highest standards and take the conduct of all our employees very seriously,” Wahl said.